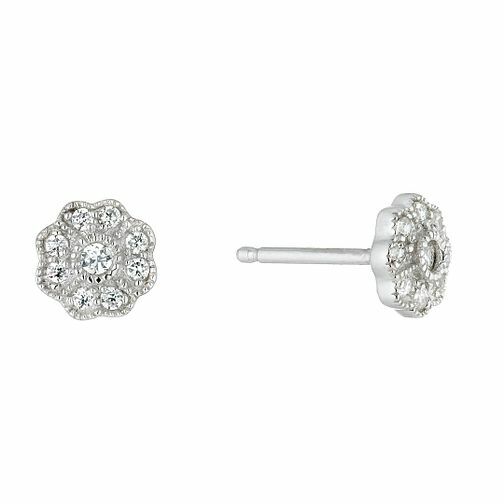 Add a pretty floral finishing touch to your look with this glittering pair of cubic zirconia set flower stud earrings. Styled in sleek sterling silver for an effortlessly chic, laid back feel. Sterling Silver Cubic Zirconia Flower Stud Earrings is rated 4.8 out of 5 by 5. Rated 5 out of 5 by Anonymous from Gorgeous and delicate - stunning item for a great price These are simple yet so effective. Purchased for a wedding and they did the job beautifully. They look more expensive than they are, a very classy item.